It is March and my wife was putting on Avery’s pajamas and our visiting family member asks “hey is that Santa on those pajamas?” Our response, “heck yeah, they still fit and they won’t fit him next year.” Ever since I decided to move to Fort Collins, Colorado and become a financial planner I have been thrifty when it comes to financial decisions. Brittany and I had just started dating and she was good with her money management, as well, but it took her a while to get used to just how thrifty I was. Surely we must be missing out on some of the finer things of life and depriving ourselves of some level of joy, but actually, I feel it helps us to enjoy the things we do have with even greater appreciation. Before you dive in, remember that what you value and where you choose to allocate your money is a very personal decision and there is no right or wrong, only that you are doing what is best for yourself and your family. More than anything, I want to help you see what is possible because I know that we all create these barriers in our head and call things “needs” when they are “wants”. 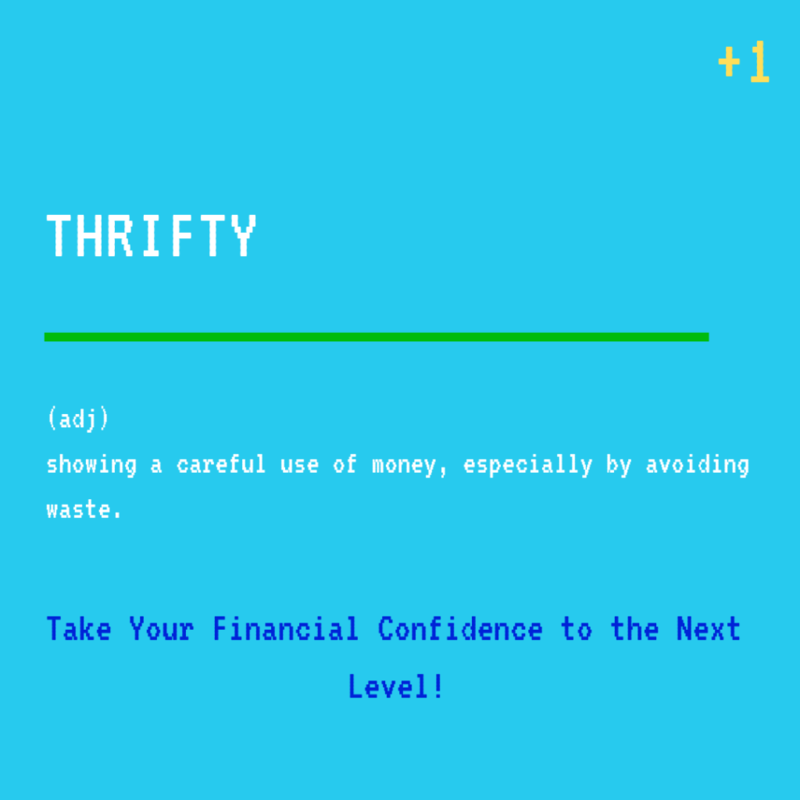 Being thrifty allows you to control your money so that it doesn’t control you. 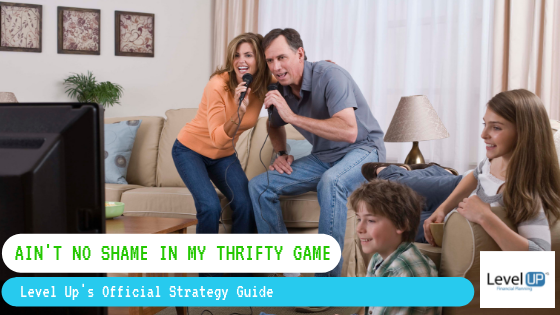 The definition of being thrifty is, “showing a careful use of money, especially by avoiding waste.” When put that way, being thrifty sounds like a good thing and it kind of is. Unfortunately, the hyper-consumerism that is America is normal and being thrifty may make you feel like an outsider, even an alien! There are two things that I think about when it comes to going against the grain. First, if it is scary to attempt, then it probably means it is worth doing. Secondly, and back to the topic of discussion, being different than everyone else is almost always a good thing. What is the problem this item or service will solve? Is this the only option or is there another way? Example: we lived without a true cutting knife for at least a year. Instead, we used a combination of a butter knife, car keys, and even our teeth. If you are considering a purchase, then you likely plan to utilize the product or service at least once, but how many times are you going to actually use it? Sometimes it’s hard to say. In these fuzzy areas, do not trick yourself into unrealistic expectations. Instead, try to ground yourself with the following possibilities: worst case scenario, best case scenario, and what is most likely going to occur. Using these scenarios you may be able to divide the expected amount of uses by the cost to see how much it will cost you per use. Example: A treadmill. Using expected uses and dividing by the hypothetical cost of $1,500. If you use it once, then it cost $1,500 to use it once. If you use it every day for two years, then it cost $2 per use. How is this item going to look or feel? Does the additional comfort and aesthetic make sense for the cost? Example: Initially we furnished our first apartment with Wal-Mart furniture. Eventually, when we felt comfortable with our finances and moved into a larger space we upgraded these items to furniture that looked less like we were college students. Is there something else you could spend your hard earned money on. I am not talking about similar items but with a different form or better functionality. Example: Choosing to go on vacations instead of dining out over the course of a year. Ultimately, your income and existing liabilities have an impact on what you can afford. When I say afford, I do not mean the ability to purchase because that is not the same thing. Many people purchase things they cannot afford. Too many people actually. Example: A doctor is more likely to be able to afford a brand new BMW than a high school gym teacher. It is possible the gym teacher may be able to purchase a BMW, but it may cause unrecoverable damages to other goals in the long-term. As a result of the high costs of college, a majority of my clients have student loan debt. Initially, it was my single vision to move out to Colorado to finish school at Colorado State University and complete the financial planning program that would allow me to test for the Certified Financial Planner™ designation. After working out all of the numbers, I was shocked to see what the cost would be to be for an out of state student! More determined than ever, I saved a ridiculous amount of money at the age of 22 so that I could make the transition without the stress of running out of money. During that high savings period, I met my wife. Originally we were just dating and I had no clue that she would be up to making the big move with me. She was attending school and working two jobs and saved a bunch, as well. It’s easy to spend a lot more than you need to when your income increases substantially. Like many young professionals who start their careers, our income had risen rapidly and did not require us to live as thrifty. We were a little less aware of where all of our money was going but were never reckless. A few more important goals popped up for us though, purchasing a home, then getting married, our first child, starting a business, and now our second child. Having financial confidence is of huge importance to me, which is why it is in my tagline “take your financial confidence to the next level!”. Having a plan that gave us the confidence to understand what we were aiming towards has made it really easy to focus in on why we have made and continue to make thrifty choices with our hard earned money. All of the different tactics and approaches used by my wife and I over the years have helped us hone our purchasing decisions over time and in my mind has allowed us to have very few expenses where we look back on and go “that was a waste of money”. You will see that some of the items below we have upgraded over time, which I think is also a valuable lesson. Starting out, you shouldn’t expect to have it all or deserve it all. That is true in our careers, as well as, our lifestyles. Starting with that expectation can easily set you up for disappointment and stress. When we first started out in Colorado, it was both of our first times living 100% independently and we didn’t want to bite off more than we could chew, so we opted for Netflix only for the first few months. Ultimately we gave in and upgraded to the lowest TV package that allows us to watch basic channels and we currently pay about $60/month. We bought the most basic pots and pans that we could find and the silverware was not anything close to resembling silver. It probably took us six years before replacing those initial items, but I have to say our pots and pans now, while not high-end by any means, are much more enjoyable to cook on. I never thought I’d use the word love with pots and pans, but these are items that I probably appreciate much more than I ever thought I could. We were one of the last few people our ages to adopt modern smartphones. Once Brittany’s Blackberry died, we decided to start integrating our finances a bit more and joined a phone plan together. We’ve carried the lowest level of memory available on the phones and lowest data plan possible and never financed our phones. We’ve been lucky enough to stretch out replacements to be every 3-4 years and in the past have been able to do so for about $30 each phone, usually opting for the previous year’s models. There are very few things that we have purchased that were not on sale. Actually waiting for a sale to materialize is sometimes part of the fun for me. Many times, we simply lose our interest in what we thought was a must-have buy and end up changing our mind about the purchase altogether. I’m glad that we’ve had this approach because the instant gratification that Amazon now offers, has rewired most consumers brains to feel like they have to act now and have it by tomorrow. Like most people, dining out is something we really enjoy, but it makes my thrifty nailed it list because we often used a few strategies that would reduce the cost substantially compared to most couples. We often shared meals and would order only water. This allowed us to either dine out twice as much for the same cost or save half the money. Ask for things that we would likely purchase for ourselves. I am not talking about socks and underwear, but things that most people would prefer to treat themselves to. New outfits, hoodies, hats, video games, and tech. Instead of purchasing these things throughout the year, through secret Santa exchanges and each other. I still feel like we spent a lot, but compared to the national average we practically eloped. We were very strategic in focusing on the vision of what we wanted and had a lot of conversations about “do we really need this upgrade or this additional add-on”. To us, our first trip out of the country to Italy is where we wanted to allocate or wedding-related spending. I like the comfort of my daily contacts, but I feel like it is really inefficient to throw them out if they still work well. This is definitely not a recommendation, because I don’t want someone to go blind replicating my odd approach. All I know is the when I go for my eye check-ups every other year, the eye doctor has never seen issues that would cause him to be onto my thrifty approach. Similar to the Christmas and Holidays’ topic above, our son has rarely received random toys or gifts on a regular basis. What we have found is that some toys that were not initially a hit when he first received them, but he has been circling back to and acting like they are brand new. He even still gets a lot of miles out of the toys he loved at first gift. We have found that he loves books most of all, which is fantastic. When we do make impromptu purchases they are books that he’ll get hours of use out of and that he can pass on to his little sister. Another baby strategy we have used is to only have about 3-4 outfits and 3-4 sets of pajamas per size range. We do multiple loads of laundry daily to make sure there are always clean clothes for them to wear. Although, he is pushing the envelope on his Christmas pajamas, who really cares if it is not in season? We love Christmas! Prior to even having Emma, Avery received a bunch of awesome hand me down toys from his cousin. We stored many away based on his age and instead of going to the store, we go to the closet to see what he has aged into. This has helped with the urge to buy him new toys every time we are in Target, which I’m sure would have been a little stronger without these hand me downs. Emma loves rocking her brothers hand me down outfits that have the argument for being gender neutral, especially in 2019 where there are no limits or expectations based on gender. So maybe some shame in my thrifty game. Haha. When thinking about some of the various ways we have been thrifty in the past or even now with my wife. Some brought us to tears with laughter and unfortunately fall under the too ashamed to admit category. When we purchased items for our first apartment, we heard that thrift shops are the place to be. I cannot recall if we bought anything else from the thrift store, but one item that Brittany and I look at and crack up about is the used toaster we purchased. The toaster worked fine but was definitely used. The fail is when we went to the store and saw a brand new one for a slightly lower cost. We paid more for a used toaster! Almost anyone who knows us has probably heard about our first apartment. At the time we signed the lease, we had recently moved to Fort Collins, Colorado from Illinois and neither of us had landed a job. To make sure we were not overextending ourselves and to make sure we didn’t burn through all of our savings we locked in a low-cost 460 sqft apartment. In summary: the place we moved into smelled like dog-pee, the oven was the size of a small microwave, and the kitchen cabinets were broken to the point that they were unusable. Despite the daily crying, Brittany and I survived the whole 1-year lease! My older brother recently got married on a cruise wedding. When the first save the dates and details went out, Brittany and I were excited, but also wanted to lock in some cheap plane tickets. A few months passed and Brittany and I found out she was pregnant and would be 8 months along by the time of the wedding. Due to using the lowest cost airline and not purchasing trip insurance, we were out the cost of our flights with no wiggle room to apply the credit to an alternate flight, which is something we have been able to do with other airlines in the past. We initially did not mean to go this route, when we were using Home Depot to install a new kitchen countertop. The plumber was going to be a contractor that had an agreement with Home Depot, but that contract fell through and we had to find someone on our own. Instead of looking for an established company, we found someone on Craigslist. He got the job done but did not give us much confidence as he worked on our sink and kept running into issues saying that our sink wasn’t normal. When we first moved out to Fort Collins, we bought the lowest cost adult bikes at WalMart. They worked well enough initially, but it didn’t take long for them to have mechanical issues. It could easily be user error or not being too handy with mechanics, but I have talked to a bunch of bike enthusiasts and they assured me that the quality of the bikes we purchased almost always have issues. How hard could it be to cut a baby’s hair? Turns out it is a lot harder than we thought. Unless jagged lines and layers is a new fad among babies. This only occurred once before we accepted that we are never going to be hair stylists and started taking our son to a cool hair salon for kids. It did take us a while to learn from our mistakes on this one. Partially because Groupon had such great deals on local restaurants and activities. Where we ran into problems is with unknown products that are drastically discounted from normal items. A few fails that we are able to recall: Italian dress shoes, a dozen assorted women’s tank tops, and a comforter set. My wife is on her second Fitbit Model, which is still one of the lower entry level options. I am still using my 2nd version Apple Watch, which we purchased on sale after a new model became available. These are definitely some of the more extravagant purchases we have made, but they were purchased as Christmas gifts. Technically, we had a couple thrifty fails when it came to purchasing laptops to finish school. We would purchase low-end models and they would start out strong, but within a few months become glitchy and within a year and a half we had two separate models become essentially intolerable. Learning from this mistake and being exposed to Surface Laptops through my previous employer, I knew their reliability would be something I need for my 100% virtual financial planning business. Almost two years in and I love my Surface, my wife also upgraded a year ago to a Surface because of the unreliable aspects of her low-cost laptop was making her online courses more time consuming than they needed to be. Movies were a big part of my childhood growing up and are still something that my family gets excited for. Even in the past when Brittany and I would go a few times a month, we often had the patience to wait until the movies made it to the $3 movies, which is a theatre that received movies weeks after their initial release, but before they are out on DVD. Up until we had Avery, we used a portion of our savings to go on fun trips. We’ve been to Florida multiple times, Italy, and Ireland. Some of our thrifty ways were made totally worth it by the freedom we had to enjoy travel without going into debt. This will continue to be a focal point of our family’s goals and I imagine, we will continue to make thrifty decisions elsewhere to make this happen. (Any tips on international travel with children are much appreciated). Our first house was definitely a starter home and really affordable even on the most modest incomes. Home values were soaring and Brittany and I knew we planned to have multiple children in our family. This led us to increase our housing cost substantially when purchasing our new home. Our combined income made it affordable, but it still was more than we needed at the time and so I throw it under the splurged category. In all realities, we are paying the going rate for a nice 2-room apartment in Fort Collins, CO. Additionally, the arrival of Emma would have forced us to make a housing change and the home prices and interest rates are ridiculous compared to three years ago and we would have either a significantly greater cost or been priced out of Fort Collins, CO. Wondering Should I Purchase a Home? Again, nothing extravagant, but we did purchase a room furniture set that was above basic needs. We also upgraded our son’s stroller to a jogging stroller once we realized how stiff his standard stroller was. Easily one of the best purchases we have ever made. Emma relies a lot more heavily on bottle feedings so we bought a little bottle warmer, which I was surprised wasn’t too expensive, but it is really easy to say that for multiple purchases and they all add up to a larger number. I had researched for about 6 months on the Hue Lighting System, which we now use daily. They were definitely not needed, but we’ve had a lot of fun syncing the colors to Bronco’s blue and orange or to change dynamically with a Netflix movie. During Halloween, I move the lights to windows that face the front of the house and sync them with scary Halloween music so they flash and change, so we definitely get a ton of use out of them. Thank the lord that Yankee Candles sends out coupons like clock-work. Still, these candles are pretty expensive and don’t really move the needle for me in value, but I know how much Brittany enjoys them. Brittany and I have an on again off again relationship with Starbucks. When I hear the word “need” my hairs stand up like Spider-Man with his spidey sense, but that is what I considered my out of control Starbucks addiction. We’ve since compromised and although I still consider coffee a “need” from a functioning human standpoint, I acknowledge that there are alternatives, extremely lower cost alternatives that can perform that function. I think my family’s ability to navigate our lifestyle today so that we can enjoy what we do have and at the same time be on track to achieving some fun and important goals makes my advice grounded and real. By providing some of the funny stories above I hope it helps you realize that you are in control of your purchasing decisions. Behavior change, especially around money, is a very emotional topic. Even with some of the thrifty decisions we have made, they were not necessarily fun to do. Especially when we have guests and they are like “where is your XYZ product” or “why don’t you guys have ABC product”. “Umm, we feel like we would only use that 3 times in a year and so we get creative and find an alternative product that works enough.” They then proceed to look at us like we are weirdos. Like most people, the wishlist of things and services is a long-running list. It is not always easy to tell ourselves, no, but it is definitely easier when we are both on the same page about what we want for our family. I want to give my clients that clarity and get on the same page. That alone has proven to be dramatically effective in helping my clients make those tough tweaks to their thinking and purchasing decisions so that they can focus on to achieve their most important goals. 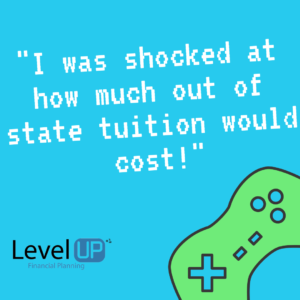 Want to find out more on Why Clients Choose Level Up Financial Planning? In a world filled with unlimited products and services, it is impossible to afford everything you could ever dream of. Instead of being disappointed that you are not a bazillionaire reflect on what things you actually do care about. Once you identify things that matter the most it is really easy to compare it to other things that you could classify as low on the totem pole and limit the dollars you spend on these items. Not today doesn’t mean not ever. 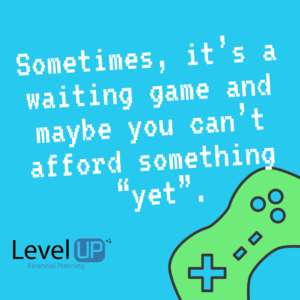 Sometimes, it’s a waiting game and maybe you can’t afford something “yet”. Rather than living outside your means, have fun with the process of earning things that take time to achieve. I hope my open book approach to sharing some of the decisions that my family has made will empower you to reflect on what you find valuable and if there is a way to shift some of the behaviors that interfere with you achieving your goals.